This roasted vegetable tart is a wonderful, light dinner that makes the most of seasonal, fresh vegetables. This could easily be brunch as well! We used zucchini, squash and onions from our Produce Box this week along with organic broccoli from the farmer’s market and some cherry tomatoes from last summer that we stashed in the freezer. The base is our very own Sticky Fig Jam and the tarts were topped with local goat cheese from Hillsborough Cheese Company. A very locavore dish! These tarts are very light and if you have hungry family, double this recipe! Unfold the puff pastry onto a parchment lined baking sheet and cut into four equal squares. Brush the squares with the egg white and use a fork to crimp the edges of each square. Bake pastry for 20 minutes. Remove from oven and gently press each square with a spatula so it is slightly flattened. Let cooling the baking sheet. While pastry is cooling, cut up vegetables into small pieces, toss with olive oil and roast on a foil lined baking sheet for 30 minutes. Stir every 10 minutes or so. Vegetables are done when lightly browned and no liquid remains on the baking sheet. Assemble your lovely tarts–spoon about 2 tablespoons fig preserves onto each puff pastry square. Top with about 1 cup of the roasted vegetables. 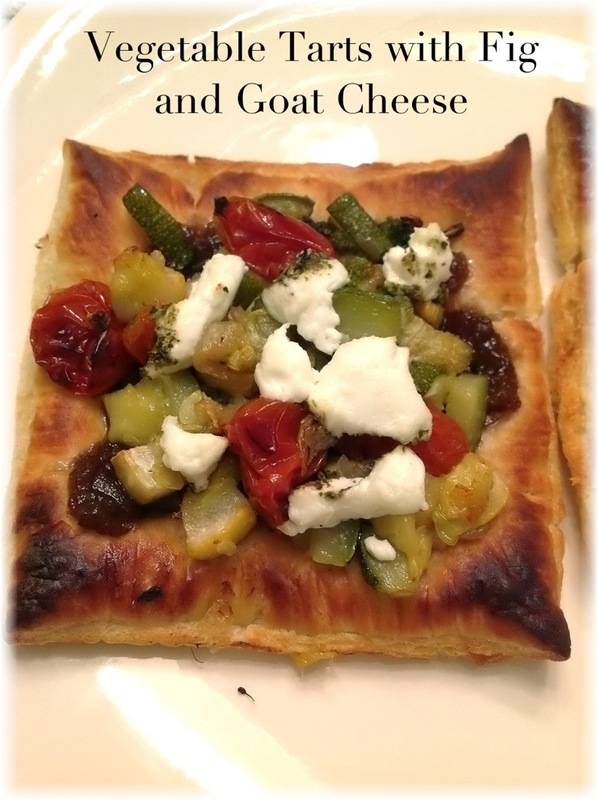 Divide your goat cheese among the four tarts and sprinkle on top. Set your broiler to low and broil put the baking sheet with the tarts under the broiler for about 30-45 seconds, just until the cheese is soft and the pastry is crispy (mine here is a little too crispy, but still delicious!). « Tutorial Tuesday #1–Where is My Farmer’s Market? You had me at goat cheese. These little tarts would make gorgeous appetizers! They are good, but light–definitely not for a ravenous crowd!! Appetizers is a great idea!! Love the fig and cheese combo! Thanks! Hey, and thank you for introducing me to coconut sugar!!! It is amazing!